Butch | You may clap? As you might deduce from the title, this film is about the legendary outlaws Butch Cassidy (Paul Newman) and The Sundance Kid (Robert Redford). The film follows the two robbers through the latter portion of their “careers” as they terrorize one last train, get tailed by an unknown horse posse, and jump ship for Bolivia with Sundance’s girlfriend Etta (Katherine Ross). This so-called “buddy film” is ultimately more about the friendship between Butch, Sundance, and even to a certain extent Etta, then it is the great escapades in which they partook. It also touches a bit on their efforts to live life on the straight and narrow, which never really seems quite possible for the two outlaws. 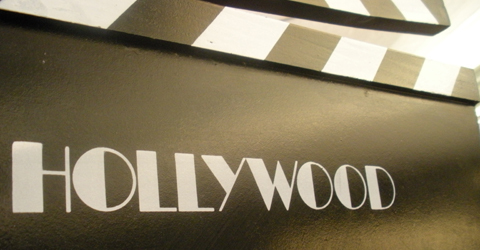 The film, directed by George Roy Hill, brought Redford and Newman together for the first time. They would re-unite in 1973 for Hill’s film, The Sting. Butch Cassidy and the Sundance Kid won Oscars for Best Cinematography, Best Original Score, Best Original Screenplay, and Best Original Song. It was nominated for Best Director, Best Picture, and Best Sound. It was nominated and won a cache of other awards, including several BAFTAS, Golden Globes, and a Grammy for Burt Bacharach‘s original score. You can view the complete list here. This movie popped to mind, because I’d seen a little part of it once (I was pretty sure anyway)– the part where they jump off the cliff — and I never saw the rest. Mostly, though, I wanted to see another Paul Newman film (I’ve only seen Cool Hand Luke, and his more recent appearances in Road to Perdition and Empire Falls). I didn’t enjoy Cool Hand Luke, so I was skeptical of this movie. But, I like outlaws as much as the next girl, so why not give it a watch. I didn’t remember much about Butch Cassidy or The Sundance Kid before watching this. I still don’t know too much about their outlaw career, to be honest, since the film is dated near the end of their heyday. In doing some research for this review, however, I found this awesome old photo of Butch Cassidy, The Sundance Kid, and the rest of their gang, The Wild Bunch. Interestingly enough, in the film their gang is not the Wild Bunch, but The Hole in the Wall Gang. It’s true, though, that the Wild Bunch would meet quite often at a hideout called Hole in the Wall in Johnson County, Wyoming. As it turns out, the various outlaws that met here were called The Hole in the Wall Gang. This referred to all of the individual gangs that would meet there, making it not just the one group, but several, including The Wild Bunch. 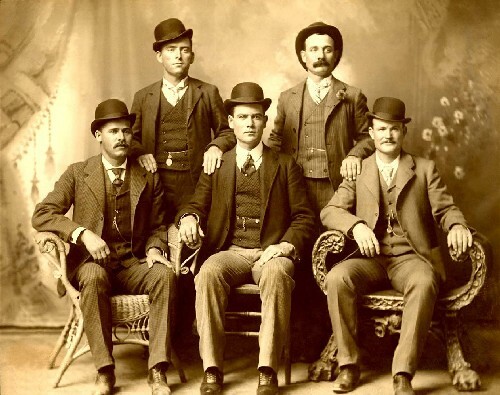 Robert LeRoy Parker, better known as Butch Cassidy, is in the lower right-hand side of the photo with his hand resting on the arm of his chair. I don’t really think Paul Newman looks much like him. The Sundance Kid (Harry Alonzo Longabaugh), seated on the far left, does look a bit like Robert Redford did in the film, though. It’s said that posing for this photo was one of the greatest mistakes Butch Cassidy made, because it allowed the Pinkerton Detective Agency to track them down. Needless to say, after doing some quick research on Butch Cassidy and his gang, its clear that the film takes some liberties with actual events, and invents others entirely. Yes, they robbed a train called the flyer, and yes a posse did follow them for a while. Yes, they did go to South America with Etta (though they originally aimed for Argentina, not Bolivia), and yes they did supposedly die in a shootout. Everything else, might be a bit embellished. You can read more of the story for yourself here on Wikipedia or on a more legitimate site of your choice. I have to say, I was pleasantly surprised by this film. It intermixed just enough humor and action to make it extremely enjoyable to watch. Paul Newman was entertaining as Butch Cassidy, but Robert Redford shined as Sundance. There was something quietly clever about his character, even though Butch was supposedly the brains of their gang. The minor characters are also rather ingenious — all endearing in their own right. They include, Woodcock (who guarded the safe on the train), the bicycle salesman, News Carver (of their gang), and poor Percy Garris (who almost helps Butch and Sundance lead a lawful life). Each of them has at least one memorable one-liner, which keeps the film enjoyable and light considering we’re watching a gang of outlaws. Stylistically, the film is a total trip too. It starts out with an awesome sepia-tone look that, to be honest, I wish had been carried throughout. Then, there’s that wonderful montage of photos as Butch, Sundance, and Etta travel towards Bolivia with still pictures of the cast intermixed with historical photos. I was hoping this was intentional, and not a montage inserted into the DVD master of the film to make up for missing footage. It was intentional. The only part I disliked about the film, though it seems to have received critical acclaim, was the bicycle scene and use of Raindrops Keep Falling On My Head. The song completely broke from the feel of the film. Why would that song be playing in the old west? It wouldn’t. The bicycle scene itself with Paul Newman and Katherine Ross, may not have bothered me had it only played out under a western-themed tune. My Darlin’ Clementine? ‘Ol Susannah? Anything! You may clap loudly for Butch Cassidy and the Sundance Kid, and if you’re like Etta, you might just run off with a gang of outlaws after watching it. Okay, no… too much? Don’t do that… please.